This is a 4 way fixture that displays shoes and boxed items on all 4 sided of the fixture. The Shoe Store Shelves System is especially designed with down slopped shelves for maximum exposure of all types of shoes and boots for kids, lady's and men. 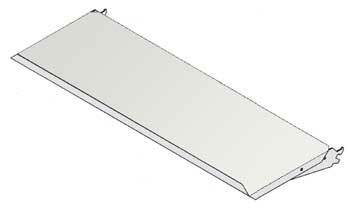 The Shoe Store Shelves are a two position shelf, flat or 40 degree down slope, for use in all products with standard Madix slotting. There is a 1" lip on the front of the shelf which is designed for light loading, as expected in one row of shoe boxes. 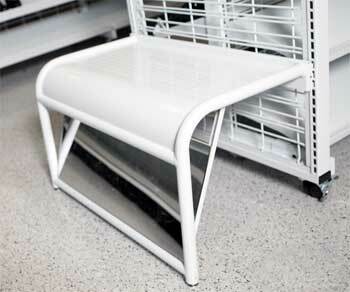 Is a two position shelf that sits flat or at a 40 degfree angle downslope. Includes a 1 inch front lip that is configured for a light load. 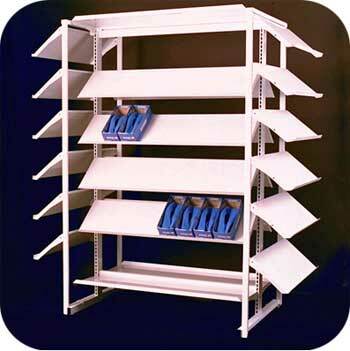 Standard shelf slots are compatible with Madix or Lozier shelving systems. Available with or without perforations. 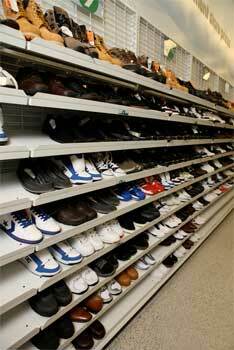 Is compatible with Madix or LozierGondola Store Shelving System.